Cake and presents are the usual suspects that steal the show at birthday parties. But it’s tradition to play games, too–games selected by the birthday girl herself. With so many details to remember, some games can be more hassle than fun. That’s why we’ve created the list below, where we’ve even included some old classics with new flare. You’ll find what we consider the top ten best birthday party games, ranking them based on fun and ease. This one always brings joy and a bit of a competitive streak. Kids circle a cluster of chairs as music plays, but the catch is that there is one less chair than players. When the music stops, as directed by a supervising parent, all kids have to find a seat fast. Whoever is left without a chair at the end is out. For the next round, remove a chair and continue until there is one kid left standing. Then, dole out the prizes! You can even trade the chairs for pillows on the ground or even have kids sit on the ground and the last to sit is out. Another old favorite, this game requires nothing but some finesse and agility to escape the clutches of the fox! Everyone sits in a circle on the ground facing each other. These kids are called the ducks. Someone is elected to be the fox, who paces outside this circle, tapping everyone on the head and saying “duck” until suddenly they choose someone to be the “goose.” The “goose” must then get up and chase the “fox” around the circle with the aim of beating that person back to that seat the “goose” left. If the “fox” gets there first, the “goose” becomes the “fox.” If the “goose” gets there first, the “fox” must try again. Gather all the kids in a circle far enough away from each other where they can’t hear each other whispering. Have the birthday girl think of a sentence she wants to pass along. It can be anything. Then, she has to whisper it in the ear of the person immediately to her right. She only gets one try to say the sentence. Then the next person must figure out what it is that was said and pass the message to the person to their immediate right. The last person to receive the message must say it out loud. Then, the birthday girl must say the original phrase so everyone can hear how far off and silly the phrase became. Brush up on the kids listening skills while they have fun with this birthday game. The birthday girl gets to be “Simon” where whatever she says goes. She starts the command by saying “Simon says…” and the other kids must do it. But, when she says to do something without first saying “Simon says…” whoever does that action is out. Last kid standing wins! Have kids stand on a line all in row with each other. Put the birthday girl a distance apart from them facing away. Then, when she says “green light” all the kids can move as quickly to her as possible. When she says “red light,” they all must stop. Anyone who keeps going is out. She keeps switching between red and green until someone reaches her. That person is the winner. This game will have everyone giggling. What do you need? A large roll of bubble wrap. Lay a 5 foot piece of it down in some kind of open space. Then, have all the kids cross the bubble wrap barefoot without popping any bubbles. Whoever gets to the other side first without popping any bubbles wins! You can even divide kids into teams. This is a game kids of every age will love. There are two ways to play this game. The first way is to sketch out a map and give the kids pictures of the clues along the route. Along with each clue they will find some sort of treasure or reward. The second way is for kids to bring their own digital cameras or cell phones and take pictures of items or scenes on a list. Whoever finds the most items on the list wins. Hunts can take place in a mall, a park, or around your home. Lists of items to hunt can include things in nature, shops, and food at the mall or items that relate to specific letters. You can send kids off in small groups with an adult chaperone if they are in public places. What do you need? Lots of toilet paper. Divide the kids into small groups of 2 or 3 and have them pick someone in their group to be the mummy. Pass out rolls of toilet paper to each group. Whichever group uses up all the toilet paper first to create their mummy wins. This new spin on the classic “Truth or Dare” will really get the kiddos excited. Have the kids stand in an open area and bop a balloon around in the air to the music. When an adult stops the music, the last person to touch the balloon must pop it and complete the dare inside. On that note, make sure to write dares on small pieces of paper and insert them into each balloon before inflating it. This game can continue as long as you have enough balloons and dares to keep it going. The kids will sleep soundly throughout the night after playing this game. Create a short obstacle course and time each participant separately, or have them go all at the same time. You can even make it into a relay race with teams. Race in the park, in the backyard, or even the driveway. And at the end, hand out prizes. These games are great for parents and kids alike. Kids will have a ball. And parents will get to sit back, relax, and watch the kids make birthday memories they will never forget. And remember, when it comes to games, the more involved the kids have to be, the more fun and memorable the games are for them. So don’t be afraid to put them to work, as long as there is a prize at the end! Looking for more great party tips? We’ve got a whole section of kids birthday party tips and tricks. 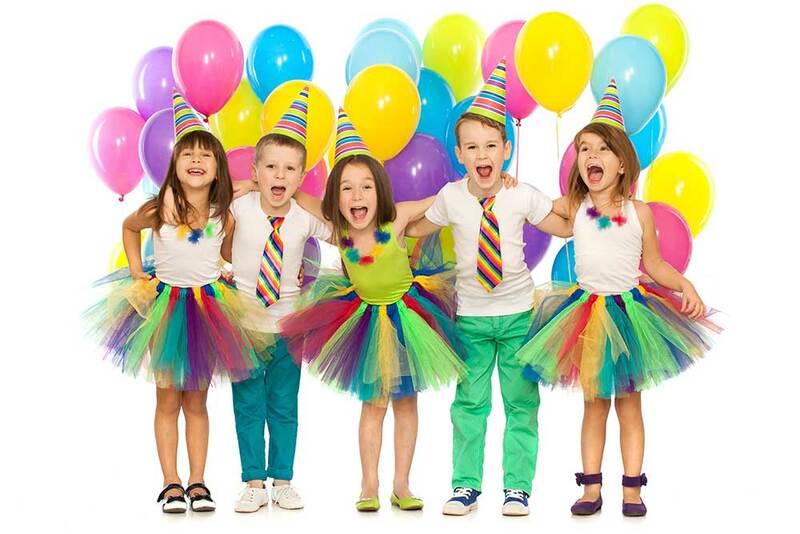 Looking for the most simple way to throw a birthday party for your kid? Than book one of our quick, easy and simple to plan party packages. The mummy wrap sounds like a fun game for children to play at a birthday party. It would also be great because the materials are not expensive. My mom knows that to make a party a success, good food also must be involved. Even when dealing with children. Helpful Post. I always keep searching about new games for my children’s birthday party. Games which you have shared are really the enjoyable stuff and interesting one. Thanks a lot for sharing!